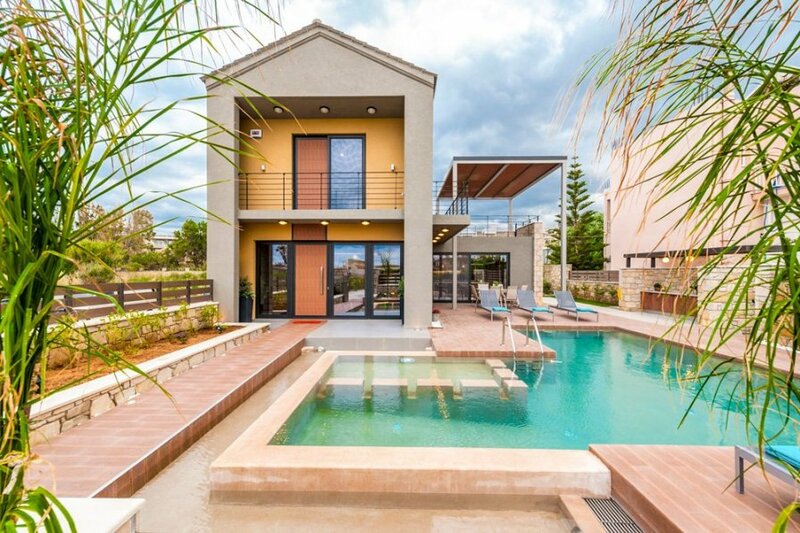 Villa Kolymbari holds a fantastic central location within the village of Kolymbari where visitors can discover the real, traditional Crete boasting a tranquil beach and delicious local food. Villa Kolymbari holds a fantastic central location within the village of Kolymbari where visitors can discover the real, traditional Crete boasting a tranquil beach and delicious local food. All the amenities necessary for a more than enjoyable stay are reachable on foot just a short stroll from the front door, this include shops, bars, restaurants as well as the large beach. For those looking for a wider choice of nightlife, the bustling resort of Platanias is less than fifteen minutes away by car, it's main street is lined with late-night bars and some of the most popular nightclubs on Crete. Chania itself is just a little further along the coastline, with its picturesque Venetian harbour, it really is a must visit. Outside, is the large private swimming pool, there is a shallow children's section which is fantastic for those travelling with little ones. An addition for 2018 is anew 80sq m2 playground area and table tennis, within a fenced area accessible from the garden area.There is also a dining area complete with barbecue which is perfect for alfresco dining on a summers afternoon under the shade of the modern pergola. Villa Kolymbari holds a central location within the village of Kolymbari where a range of helpful amenities can be found just a short stroll from the front door. The bustling resort of Platanias is less than fifteen minutes away by car, it's main street is lined with late-night bars and some of the most popular nightclubs on Crete. Chania itself is just a little further along the coastline, only a 25-minute drive away and with its picturesque Venetian harbour, it really is a must visit.